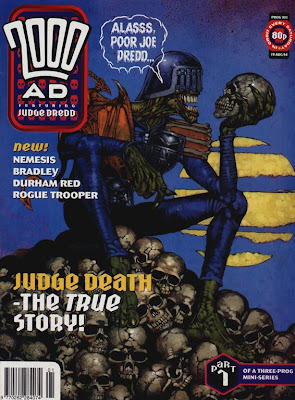 Dredd Reckoning: Judge Death: Death Lives! We've got another special guest this week. David Wolkin is not, in fact, me, although we are frequently mistaken for each other in print for understandable reasons. He's the Executive Director of the Jewish learning organization Limmud NY, proprietor of Wolkin's House of Chicken and Waffles (and Comics), and a Twitter personality. I had the pleasure of talking with David about Judge Death: Death Lives!, the first themed collection published as part of the current U.S. Simon & Schuster Dredd reprint series. 1. The idea of a post-futuristic version of "Cop and a Half" with Sylvester Stallone and Rob Schneider in the title roles appeals to me. 2. I am biologically compelled to watch and enjoy any movie starring Armand Assante. To prove this statement, I will share that on a recent vacation to Hawaii, I was preparing to go to the beach, but was delayed by 2 hours once I saw that Assante's "The Odyssey" was playing on Syfy. I am not kidding about either of these things even a little bit. I feel that it's always essential to share my background (or lack thereof) when it comes to cultural commentary so that potential readers can have an honest understanding of where I'm coming from. I may lack the capacity to fully appreciate these stories in their broader context, and I may be more qualified to talk about the incredibly handsome Armand Assante than I am the exploits of one Joseph Dredd. BUT: we reside in a culture in which people excel at taking everything out of context, so none of you have the right to judge (Dredd) me. I'd hold that pun in the last sentence against me, though. As someone who has sort of fallen in love with British comics though reading collections of Charley's War, I want to address a larger question of form before I get into the meat of this. I'm at a point in my comics reading career where I definitely don't care for the mainstream superhero stuff like I used to. I can spend 4 bucks, buy 22 pages of story, and proceed to read a comic in which it seems like next to nothing happens. 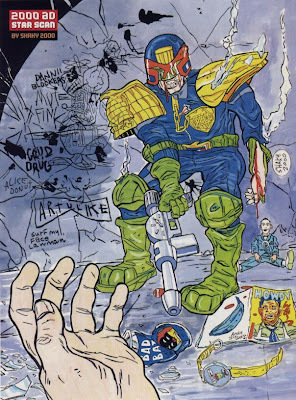 But then I can read five pages of a Dredd story (or any 2000 AD prog, for that matter) and be utterly satisfied, no matter when it was created. There's something about this limitation that has trained the creators to truly pack everything they can into a story. Guess I'm a compression guy now. But let's get to the nonsense, son. I loved just about every part of this collection. I'm inclined to wonder if my lack of context affected my enjoyment in anyway, because it's interesting to learn what a big deal these characters are in Dredd mythology (or are they?). I read in that interview you sent me that the last time these Dark Judges appeared, it was in a story with Batman. So I'd say that the first strike against this collection is that Batman never showed up. Nor was there anything remotely resembling Armand Assante. Strike two. I dig Judges Death Fear, Fire, and Mortis. Like, I dig them, the way maybe Lenny Bruce used to ask his audience to dig things (I don't know what this means). But I was struck by the fact that they were simultaneously terrifying and just totally ridiculous, and even moreso by the way they evolved into caricatures of themselves over time, even though they started out as caricatures in the first place. I don't even know what to say about "The Three Amigos," but I know I loved it. Like, I think I need a tutor to explain Clinton Box to me. And I read grown up books! On a deeper note, I'm somewhat struck by the metaphysical implications of these characters, and my mind kept being drawn back to the Rabbi Neal Gillman's groundbreaking theological work in "The Death of Death". If I remember correctly, that's a book about the broader eschatological claims implied by Biblical texts that suggest a time in which everyone will come back to life. That would be the perfect time for the Dark Judges to show up, come to think of it. DOUGLAS: Man, just wait until you see "Judgement Day," whose premise is that an evil magician brings everyone back to life... as zombies. One thing that's interesting to me about the material collected in here is the tension between what the readers want--their favorite characters, over and over again--and what John Wagner's interested in giving them. I suspect that, given the chance, most mainstream comics publishers would bring back the Dark Judges every few months, like the Joker. Leaving them offstage for 13 years means that their return a couple of weeks ago really did have dramatic impact. The most eyebrow-raising revelation in this recent John Wagner interview is that Wagner hadn't intended to use the Dark Judges in "Day of Chaos"--which means that "Day of Chaos" isn't the "Dark Judges return" story, which means I have even less of an idea of where it's headed, which is awesome. The takeaway other people seem to have gotten from the interview is "all four are going to be reunited"; I don't know if "if I can find a way to make it work..." quite counts as that. But it does mean that Wagner's mulling over post-"Day of Chaos" stories--that's excellent news! Still, Wagner mentions another conflict that gets near the heart of both what's wonderful about his writing and what sometimes undermines it: that his impulse is always to go for black comedy. Even the first Judge Death story has undiluted moments of comedy in it; its plot-resolving MacGuffin calls back to "Palais de Boing," which is as silly an episode as Dredd has ever seen. What gives the Dark Judges their impact is that they're absolutely terrifying, both in conception and in design (that sheep skull!) --I dig them too. But they're so serious that Wagner often can't resist sticking banana peels in front of them, especially Death. When they turn up in the middle of "Necropolis," it's a freezing thrill; when they turn up in Batman/Judge Dredd: Die Laughing, it's a "here ya go! just the way you like it!" moment. David Brothers and I talked about The Life and Death of... here last year, and noted the way Death eventually becomes a burlesque of himself when Wagner can't raise the stakes of his appearances any longer. Consider the publishing context of the post-Brian Bolland stories here. 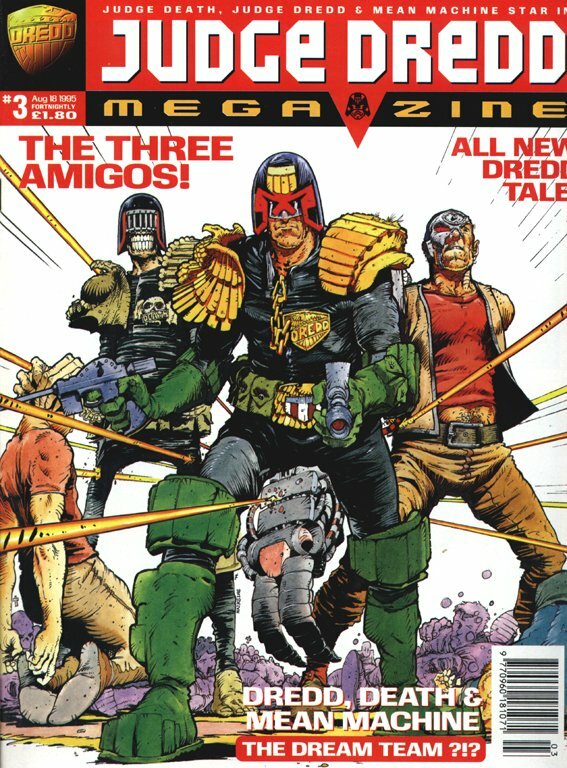 "The Three Amigos" is straight-up fan-service: Death and Mean Machine Angel were two of the Dredd nemeses that readers loved best, and their team-up was intended to lead off the first issue of the relaunched Judge Dredd Megazine in 1995, to tie in with the movie. (It ran so late in production that a couple of short fill-in episodes appeared in the first issue instead, and "The Three Amigos" began with the second issue.) Wagner had killed off the entire Angel Gang at the end of their initial appearance in "The Judge Child," then resurrected Mean Machine a bit later. The whole gang appeared in the movie, though, so Pa and Junior were brought back in this one (with some more explanation in Prog 958's "Awakening of Angels," published the same week as the fifth episode); Wagner later admitted that that was "a step too far." 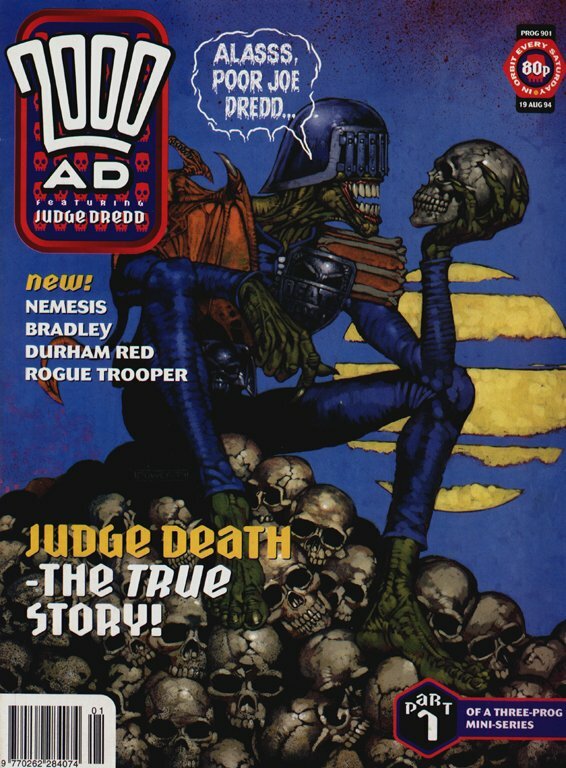 For the most part, in Judge Dredd stories, dead means dead (or at least "kinda dead"). "Dead Reckoning" (after which this blog wasn't deliberately named...) began in 2000 AD #1000, a year later. 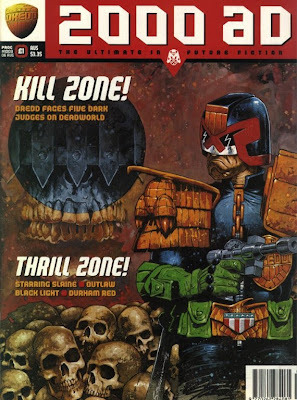 You can imagine Wagner realizing that he needs to write a big story for the big round number, scraping to work up a Judge Death plot he hadn't done already: maybe if Dredd went to his world... but wait, isn't everyone on it already dead? Well, if he goes to the past of that world... And then he figures out that he can put Death in a little-old-lady dress and wig, and that's amusing enough to get things in motion. Meanwhile, like "The Three Amigos" before it, it had to put Judge Death back in exactly the same box at the end, just to keep the continuity straight for the long, long, long-delayed Die Laughing. Since Wagner habitually leaves major characters in a significantly different place at the end of long stories, both of these seem more like treadmill exercises than they would otherwise. Very nice Greg Staples art on "Dead Reckoning," though. I see how the offer of some more might tempt Wagner to get the band back together. "Theatre of Death" is really an epilogue to "Necropolis," and Ron Smith drawing it is one more callback to the first act of the series that "Necropolis" ended. It's a little curtain call after that grand finale, leaving open the question of whether the fall of Chief Judge Silver really happened that way at all (Garth Ennis later argued that it didn't). And "Judge Death: The True Story" revisits the territory of old age, infirmity and mortality that Wagner had been poking at since "Alzheimer's Block," and that was particularly a focus of his around this time (see also "Bury My Knee at Wounded Heart" and "Return of the Taxidermist")--that "oh well, they were just old people, NBD" conclusion is brutal. And as for narrative compression: hell yes. 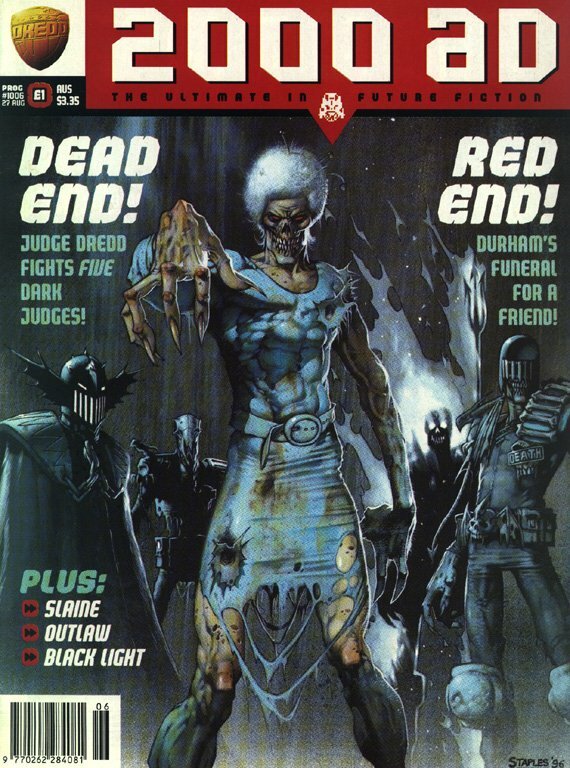 That first Judge Death story is fifteen pages long, and more happens in it than in three issues of any mainstream book published right now except maybe Casanova. Even now, 2000 AD stories tend to be very densely packed, maybe because decompression was never an option for its format. It takes a lot of work to significantly advance a plot in a four-to-six-page episode of a story, especially if its art has room to be more than simply functional, but Wagner (and Pat Mills and Robbie Morrison and Al Ewing and John Smith and others) still pull it off week after week, bless them. So here's a question for you: what do you think of the look of these stories? How does this stuff compare to American mainstream comics for you, visually? DAVID: The art, Douglas? You're asking me about the art? You know how there are those people who read comics and when you talk to them about the art, they say, "I'm not really much of an art guy, I'm really more of a story guy" but what they really mean is, "I lack the intellectual chops to say anything about art but I am ashamed" and you start to ask yourself how such a preference is even possible because you never met a music fan who said "I don't really pay attention to the guitar, I'm more of a bass guy" and that analogy, while imperfect, at the very least illustrates the fundamental ridiculousness of such a preference and I don't know if there should be a question mark at the end of this sentence because I'm like Gabriel Garcia Marquez writing The Autumn of the Patriarch? By and large, I enjoyed the art on this quite a bit. Brian Bolland's first couple of stories are just so clean and perfect to me, and as much as I enjoy the others, they doesn't compare quite as much in my mind. 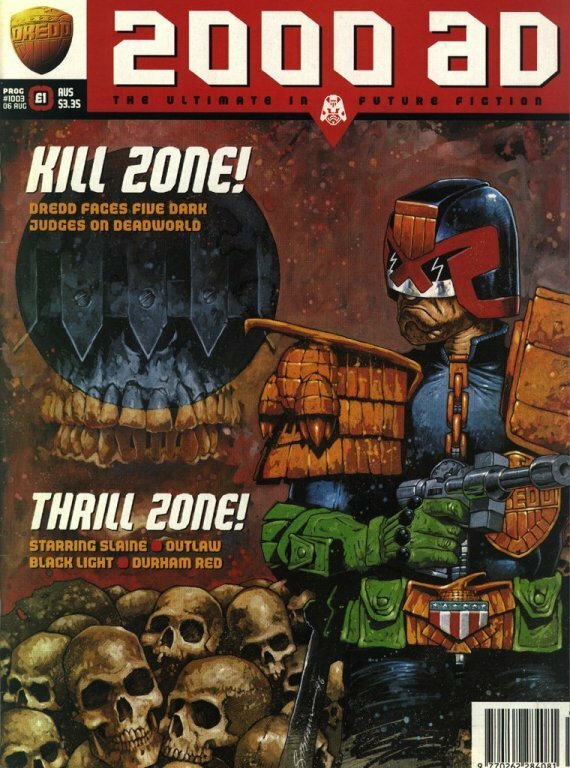 In that interview you referenced, I was struck by Wagner's mention of the fact that they haven't changed the Dark Judges' costumes since Bolland's original design. Everything he does is always so memorable for me. Greg Staples and Trevor Hairsine particularly reminded me of John McCrea and Carlos Ezquerra, but then again, those are guys who have worked plenty of Dredd stories too. One thing I noticed: the relative colorful cartoonishness of the art seemed to line up with with the increasing silliness of the stories themselves. 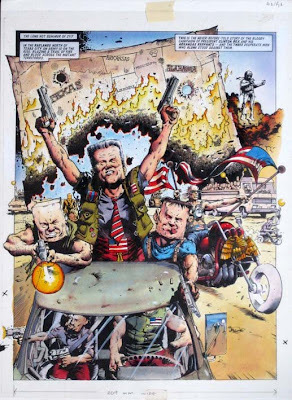 Anyways, I really enjoyed Greg Staples in particular... and as for your question about mainstream American stuff, it's hard for me to draw a comparison. Even in these ridiculous stories, I see a precision and care for the art that seems absent in the American books that I've since given up on reading. 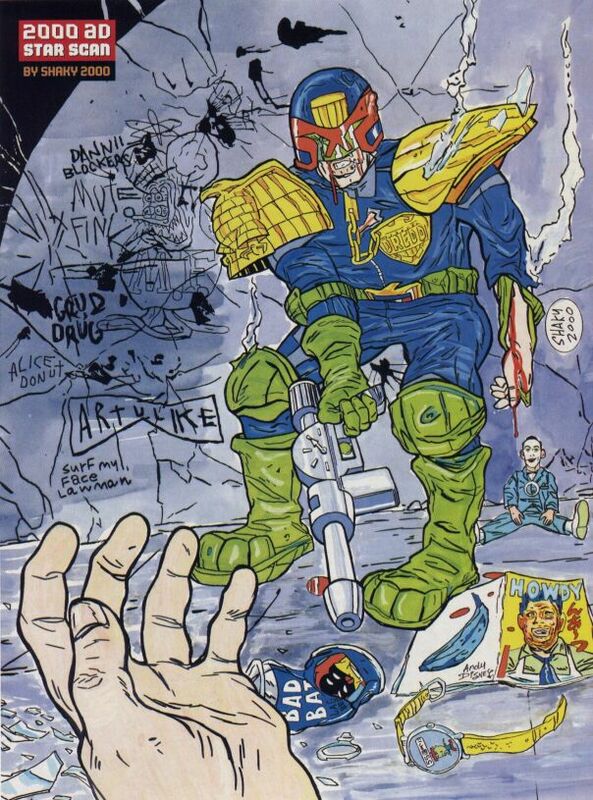 Which is not to suggest that all American books are bad, which they are not, but to say that the level of quality that I feel like I can get in most of the Dredd stuff I enjoy is that standard, while I have to pick out gems when I'm reading the American books these days. I also noticed that that most of the pages are pretty crowded. To my surprise, I actually enjoyed that quite a bit. Anyways, did you know that Armand Assante, Sr. is quite the artist? DOUGLAS: See, I learn something every time I do one of these dialogues with somebody! I'm with you on the gloriousness of Bolland's stuff. I still have difficulty understanding the fact that he's drawn more pages of Camelot 3000 than of Judge Dredd. You're also right that the goofier stories tend to go more to the artists who lean toward comedy, although I don't think Trevor Hairsine had quite found his feet with the funny stuff yet at the time he drew "The Three Amigos." Still, nice job on designing Clinton Box. They do take silliness seriously in British comics. Thanks again to David! 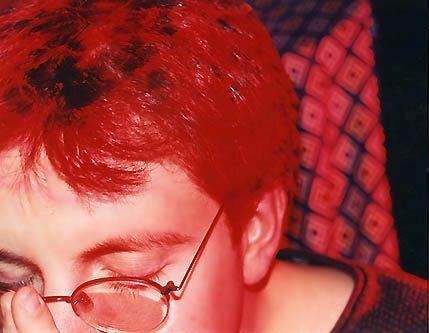 Next week: Blind Justice, collecting John Wagner and John Burns' 1993-1997 collaborations.